Provide your parrot a healthy alternative by preparing your own bird food. For maximum nutrition, use Sunshine Factor (1oz certified organic palm fruit oil) instead of cooking oil when baking. • Preheat oven to 350°F (177°C). 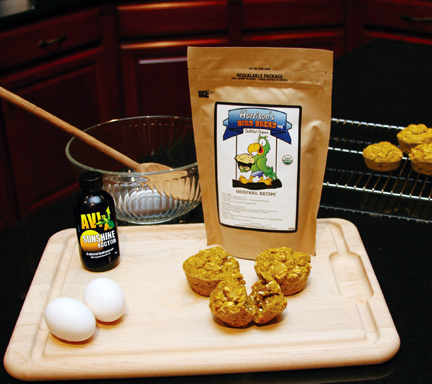 • Combine entire bag of mix with 2 whole organic eggs - no shell (remove yolk for less fat), 1 Tablespoon (15 ml) AVIx Sunshine Factor® or other high quality organic vegetable oil, and 1 cup (235 ml) water. • Fill greased bread pan or muffin tins and bake for 25-35 minutes. • Do not bake in nonstick (PTFE-coated) cookware, as the fumes are toxic to birds. • May make up to 30% of the daily diet. • If prepared with the addition of fruits, vegetables or nuts, Bird Bread should be considered a “treat” and fed only in limited quantities (no more than 10% of the daily food allotment when combined with all other treats). • Can be served warm. • Some flavorings (vanilla, maple) or herbs can be added as long as they do not change the nutritional content. Because Bird Bread Mix contains no preservatives, some care is recommended for storage. • If the bag is opened, the top can be zipped closed or rolled down and closed with a chip clip for 4-6 weeks. • Bird Bread can be stored for 1 week in the refrigerator and up to 6 weeks in the freezer after baking. 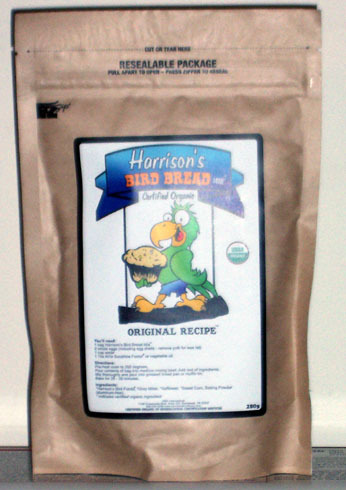 • Baked Bird Bread can be divided into portions, wrapped in plastic wrap and placed back in the original Harrison’s Bird Foods bag for storage in the freezer. • Bird Bread should not be reheated in a plastic container. (min.) 9%, crude fiber (max.) 5%, moisture (max.) 10%.